Instead of spending Thanksgiving in L.A. again this year, we decided to take a road trip to Death Valley National Park, on the California-Nevada border. 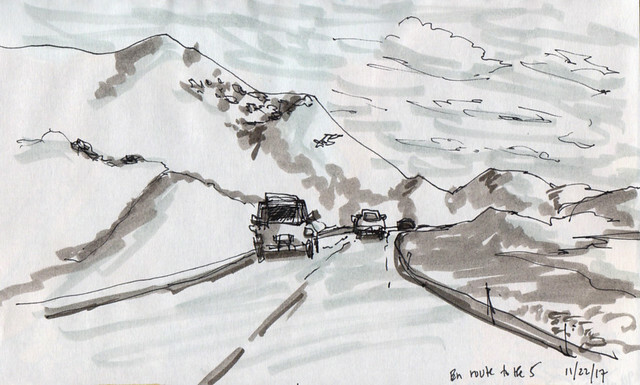 Started off with the usual Pacheco Pass sketches on the way to the I-5. I brought a mix of random paper along on this trip -- my Strathmore sketchbook with very thin paper, a Hand Book journal, a Fluid 100 watercolor block, even a Canson mixed media paper sample from the USk Symposium. Contrary to popular belief, Death Valley is much more than extreme summertime heat and vast salt flats well below sea level. Our first stop was the Mesquite Sand Dunes. They are exactly what you envision dunes to be if your frame of reference is, say, Lawrence of Arabia. We also went on several canyon hikes. 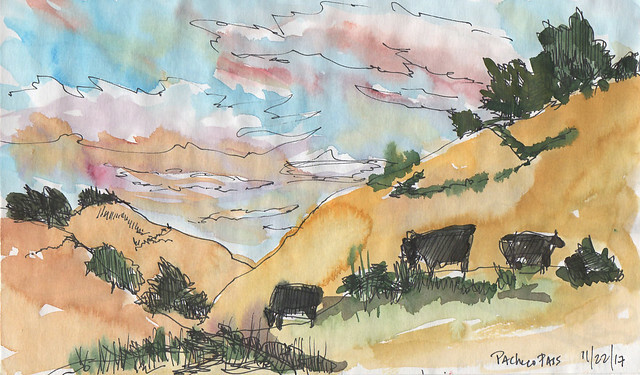 Here's a sketch of Grotto Canyon. We couldn't go too far in because of a sheer, high wall of rock beyond that cavelike area. Apparently there's a way to go around it, but we didn't know it at the time. 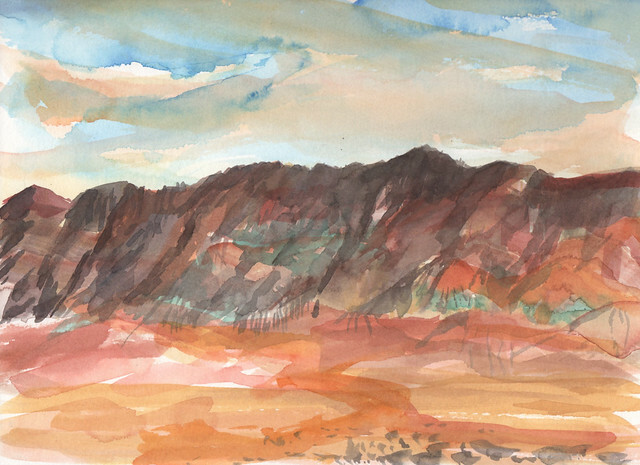 I tried to paint the view of the pigmented hillsides from the parking area at Devil's Golf Course (a field of otherworldly salt formations), but the Fluid 100 watercolor block I was using was acting more like hot pressed than cold pressed paper. I couldn't get the paint to sit on the paper and move around. We hiked Golden Canyon in the early morning, before everyone else mobbed the parking lot. 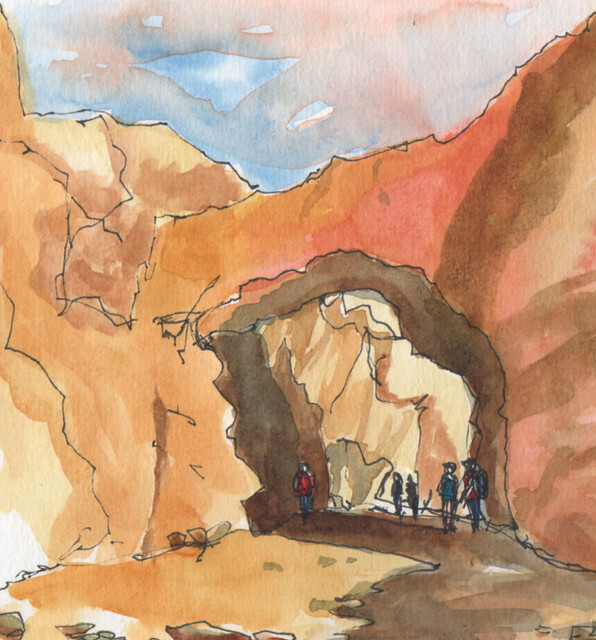 The payoff was Red Cathedral, its sienna-colored formations contrasting with the ochre of the surrounding rock. 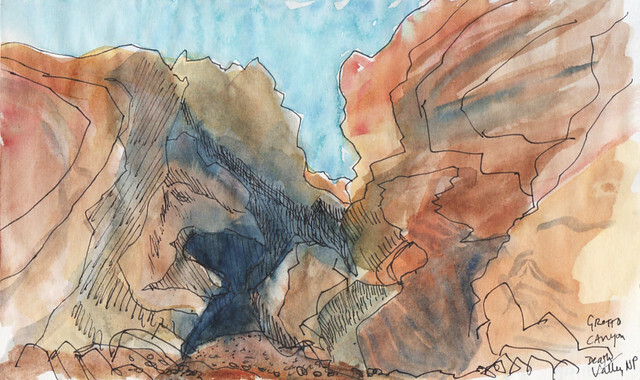 And this is a sketch of Natural Bridge Canyon. The trail was overrun with tourists posing for Instagram shots. A highlight of our trip was the natural hot springs in Tecopa, outside the park. It was quite an experience to walk out on the flats in the moonlight and sit in the warm water in perfect silence, toes in the squishy mud, looking up at Milky Way. 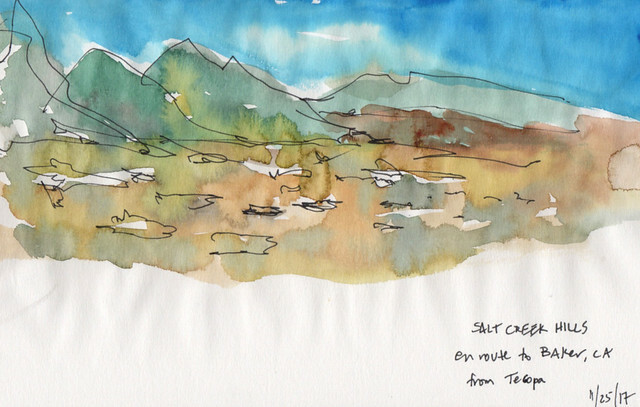 On our way home, I rapidly sketched the Salt Creek Hills as we passed them on the highway. I'm surprised that so many of my colleagues and friends here in the Bay Area have never been to Death Valley. They don't know what they're missing! Art Supply Swap + Owls!